Moira Illeniel was the name she lived by, but her true heritage was more complicated than that. 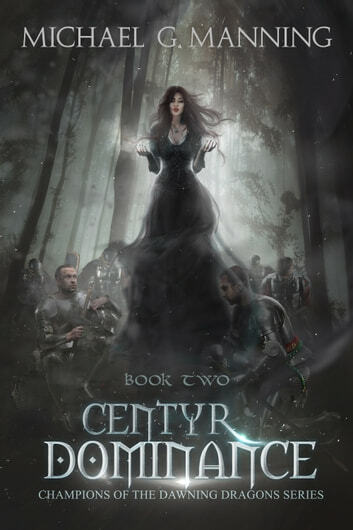 From birth, she was the secretly adopted daughter of the most powerful wizard in the world, but few knew that her true birthright came from the Centyr lineage. Traveling to Dunbar to discover the fate of her vanished father, Moira must face the darker aspects of her power. Forced to fight a foe unlike anything seen before in Lothion, she will learn the reason for the warnings her mother’s shade gave her—why certain abilities should never be used and some lines never crossed—for some doors once opened, might never be closed again. I have been a fan of Michael G Manning's work from his first book in the Mageborn Series, and once again he has served us an incredible tale. Mort's oldest daughter, Moira, is the focus of this book and boy has she grown up! A woman of great power and will, Moira sets out to find her father and before long....well, you need to read the book. You won't be disappointed! Michael has written a fascinating story with many dark twists and turns that has left me eagerly awaiting the next installment in this series! Another brilliant addition to the series. Character and situtation descriptions are amazing. I love how Manning gets the reader thoroughly inside the heads of his creations, and able to empathise with all of them. Once again, I've finished wanting more. Bring on the next one! I'm a big fan of the Mageborn series and I'm really enjoying how Manning is continuing the tail by breaking off to include the children while maintaining the characters created in the Mageborn series as well as keeping it more of an adult level read. I wasn't sure I liked the direction that he took Moira's character and whether or not she would succumb to a darker path but, we all know how the turnings of a teenage mind can go down many paths. I'm very eager to see how Mr. Manning continues to spin the tail of these great characters. Thank you for another amazing, gripping and downright fantastic read! Keep on writing please because without these books I don't know what I would do.